Automotive tailgate is the rearmost door of the vehicle, which moves upwards or downwards for the duration of loading and unloading and offers access to the vehicle boot area. Automotive tailgate are made of metal, plastic, and other polymer material and are usually found on hatchbacks, SUVs, compact SUVs, sedans, crossovers, and light pickup carrier trucks. Automotive tailgate is the closing door of the boot or passenger compartment situated at the rearmost end of the vehicle, which is either fully hydraulic operated, or power operated, or manually operated. Rapid rise in demand for sport utility vehicles, hatchbacks, and crossover, across the globe, as a new flock of mainstream models influence consumers, supplemented with a decline in car loan rates, easy availability of finance with customized financial schemes offered by banks and car dealers, coupled with rise in per capita income of consumers are key factors driving the production and sales of vehicles. This, in turn, is boosting the demand for the automotive tailgate, which is a complex vehicle part that is used as the rearmost door in the car. These are major factors that are likely to propel the automotive tailgate market during the forecast period. Automotive tailgate greatly influences the esthetic appearance of the vehicle, as it is located at the exterior rear-end of the vehicle. For light commercial trucks, automotive tailgates safeguard the load carried on the integrated trailer. This, in turn, is anticipated to drive the automotive tailgate in the near future. Automotive tailgate offers numerous benefits; however, the market faces a couple of limitations. The power operated tailgate consists of sensors and mechatronics component to assist in opening and closing of the vehicle, which leads to higher maintenance and replacement cost of the power operated tailgate. A traditional or manual tailgate requires human intervention and supervision for opening and closing. These factors are likely to hamper the market during the forecast period. The global automotive tailgate market has been segmented based on tailgate type, material, vehicle type, sales channel, and region. Based on tailgate type, the global automotive tailgate market has been classified into hydraulic operated tailgate, power operated tailgate, and manual operated tailgate. In terms of tailgate type, power operated tailgate is a highly attractive segment of the market. This is majorly due to a rise in the demand for high performance, efficient, and advanced products and technology, which has prompted automakers and OEMs to develop power operated tailgates that do not require human intervention of locking and unlocking the tailgate. Based on vehicle type, the global automotive tailgate market has been split into passenger vehicle and commercial vehicle. In terms of vehicle type, the passenger vehicle segment leads the automotive tailgate market. The segment is likely to maintain its leading position in the market during the forecast period. The utility vehicle sub-segment is anticipated to hold a major share of the passenger vehicle segment of the market during the forecast period. The utility vehicle sub-segment includes SUVs, crossovers, and MPVs. Demand for utility vehicles is rising across the globe, owing to their advantages such as driving comfort, riding height, and drivability on off-road conditions. Based on sales channel, the global automotive tailgate market has been bifurcated into OEM and aftermarket. OEM is a highly attractive and lucrative segment of the automotive tailgate market. Expansion of the OEM segment is primarily attributed to the incorporation of the automotive tailgate as a primary component by major car manufacturers, which offers superior product quality as compared to aftermarket tailgate, which is expensive. Additionally, increasing improvements in materials have led to no or rare replacements of the automotive tailgate during its entire life cycle. 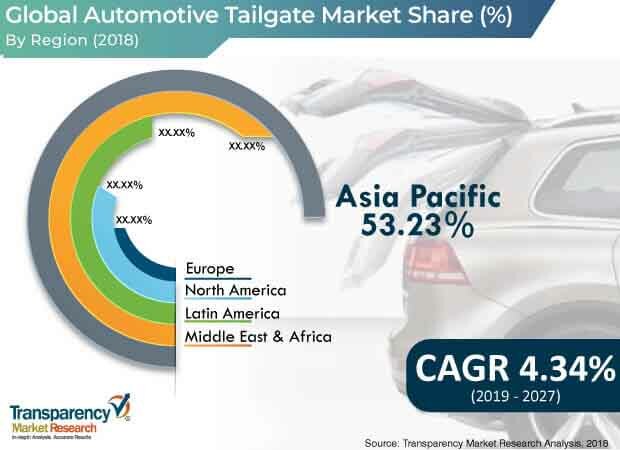 In terms of region, the global automotive tailgate market has been segregated into North America, Europe, Asia Pacific, Middle East & Africa, and Latin America. Asia Pacific accounts for prominent share of the market. This is primarily due to a surge in vehicle production in China, India, and Japan. Furthermore, countries with high vehicle production around the world are from Asia Pacific, which is attributed to the higher share held by the region in the global automotive tailgate market. The region is projected to maintain its dominant position during the forecast period. Moreover, entry of premium auto manufacturers in the region is also likely to propel the automotive tailgate market in the region. Major players operating in the global automotive tailgate market include Magna International Inc., Robert Bosch GmbH, Plastic Omnium, SEOYON E-HWA, Rockland Manufacturing Company, Zhejiang Yuanchi Holding Group Co.,Ltd., GORDON AUTO BODY PARTS CO., LTD., Huf Hülsbeck & Fürst GmbH & Co. KG, Woodbine Manufacturing Co. Inc., and Go Industries, Inc. The report comprises a detailed price trend analysis, government regulatory scenarios, value chain analysis, which provides a comprehensive view of the global automotive tailgate market. The Porter’s Five Forces model for the automotive tailgate market has also been included to help understand the competitive landscape in the market. The study encompasses market attractiveness analysis, wherein end-users are benchmarked based on their market size, growth rate, and general attractiveness. The study provides a decisive view of the global automotive tailgate market for vehicles, by segmenting it in terms of material, tailgate type, vehicle type, sales channel, and region. These segments have been analyzed based on present and future trends. Regional segmentation includes the current and forecast demand for automotive tailgate in North America, Europe, Asia Pacific, Latin America, and Middle East & Africa. The report also covers demand for individual Tailgate Type segments in all the regions. The study includes company profiles of major players operating in the global market. Key players operating in the automotive tailgate market include Magna International Inc., Faurecia, Robert Bosch GmBH, Plastic Omnium, SEOYON E-HWA Automotive Slovakia, Rockland Manufacturing Company, Zhejiang Yuanchi Holding Group Co.,Ltd., GORDON AUTO BODY PARTS CO., LTD., Huf Hülsbeck & Fürst GmbH & Co. KG, Woodbine Manufacturing Co. Inc., and Go Industries, Inc. Market players have been profiled in terms of attributes such as competitive landscape, manufacturing footprint, company overview, financial overview, business strategies, and recent developments. The market for automotive tailgate is primarily driven by the rising demand for eco-friendly vehicles. The report provides the market size for 2018 and forecast for the next nine years. The global market size of automotive tailgate has been provided in terms of revenue and volume. Market numbers have been estimated based on key tailgate type, material, vehicle type, sales channel, and regional segments of the automotive tailgate market. Market size and forecast for each major tailgate type and vehicle have been provided in terms of global and regional/country markets.